Update: For those who like financial dramas, the record sold for $55.78; there were four bids and the winning bid came in seconds before the bidding closed, perhaps suggesting someone with much eBay experience. I find this fascinating on several levels. 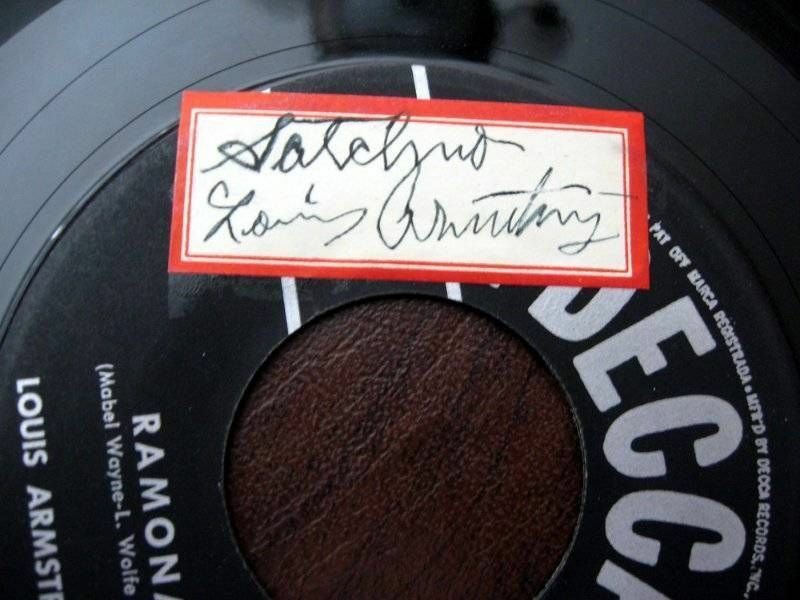 Autographs are a gossamer bridge between us and the people we admire and revere: for as long as it took to write those letters, Louis Armstrong touched the piece of paper that we, too, can touch. It is now possible to “do” the entire Louis tour. Here’s the Oliver band, there’s Henderson and Bessie, Hot Fives and Sevens; wave to Lillie Delk Christian and to Johnny Dodds; big bands, Okehs, SONG OF THE VIPERS, Deccas, Victors, Columbias, MUMBO JUMBO, airshots and broadcasts, all the way up to THE NIGHT BEFORE CHRISTMAS. It would take some time — one might need a college course to do it properly (calling Professor Ricky Riccardi of Queens College) — but much of the music is available, however poorly or incorrectly annotated, in cyberspace. But how many people, like me, begin their Louis-journey with music recorded in the Fifties that has small credibility as “jazz”? I bought many Decca compilation long-playing records before bravely encountering the Hot Fives and Sevens, and these — apparently not very important — records were my introduction to the man. Legend has it that Joe Glaser, who managed Louis for decades, was always fiercely longing for a hit, a pop record that would sell millions and make money. 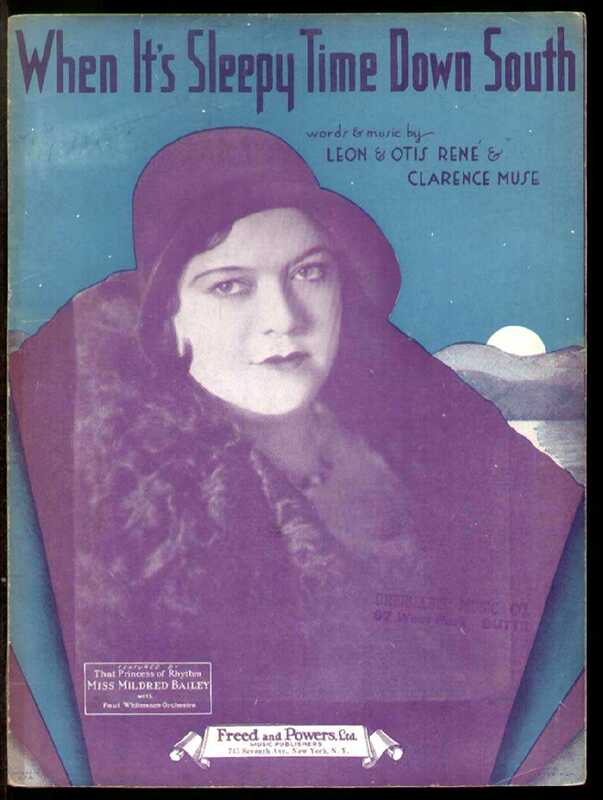 Thus, we have APRIL IN PORTUGAL (originally written in 1947 and a substantial hit in April 1953) backed by RAMONA, from a 1928 film. 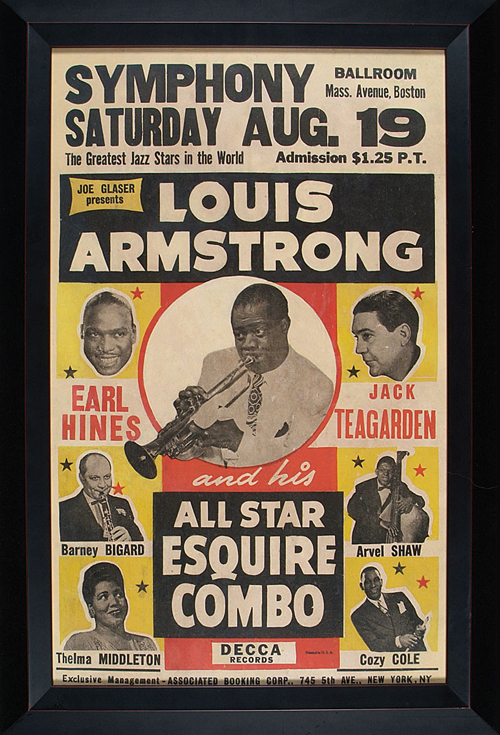 I won’t attempt to elevate this “popular music” to the level of “high art,” except to ask you to listen closely to Louis’ trumpet on RAMONA, which to me is astonishing, and to the casual conviction with which he sings both songs. And if you are one of those who refuses to surrender the myth that Louis, genius, was forced to parade himself and record such inferior materials when he should have been playing WEATHER BIRD, I leave you to your myths. He did it; he could do it; he always did it. This just in: if you’d like a truly comprehensive look at these performances, visit here. But beware! Ricky’s blogposts — although legal and non-caloric — are seriously addictive. Incidentally, the song takes on new shadings of meaning when you hear the verse: the speaker is dreaming of going back to Virginia, hardly the Deep South. 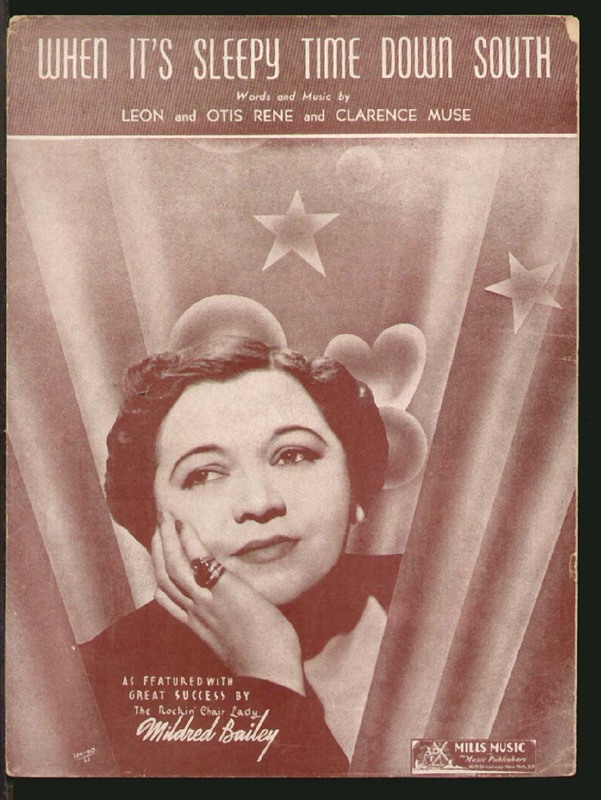 This sheet music cover is new to me: I note that Mildred was no longer a Princess, although she Featured songs With Great Success. (I wouldn’t argue with that.) And the original publishers seem to have been delicately consumed by Mills Music. I have no idea of the date of this second issue, but the picture suggests the mid-to-late Thirties. A man — you’d know him once I mention his name — recorded this song first, almost six months before the Whiteman record. He sang and played it every night onstage for forty years. Why is there no sheet music with him on the cover? In the period before his great popularity in the Fifties, I’ve seen him on the cover of one song — LIGHTS OUT, circa 1936. He was anything but invisible in all other media: you could see him in theatres, in concerts, at dances here and abroad; he broadcast on the radio and had his own program; he stole the show in films. But no WHEN IT’S SLEEPY TIME DOWN SOUTH. P.S. I don’t see his invisibility as a racial issue: other African-Americans got their bands or their pictures on sheet music. The only hypothesis I can invent is that Mr. Collins and then Mr. Glaser wanted too much money for Our Hero’s visage to be Visible. May your happiness increase.